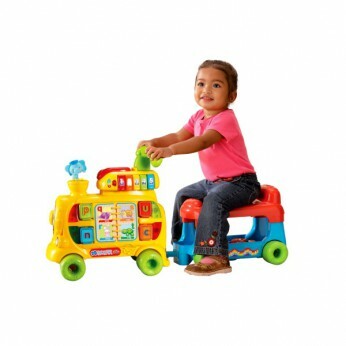 Let the Push and Ride Alphabet Train drive you to learning fun. With 3 grow-with-baby features for sit-down, walker and ride-on play, it’s a perfect place for your baby to develop. Put the 13 double-sided, chunky letter blocks into the hotspots to hear the driver introduce letters, objects and animals. The driver will encouragingly ask your baby to find objects, animals and letters in relationship to the 14- page non-rip alphabet learning book. This toy costs approximately £34.99 (for the latest and best prices make sure you check our retailer list for the VTech Push and Ride Alphabet Train above). In our review of VTech Push and Ride Alphabet Train we classed it as being suitable for ages 1 to 3 years but recommend you check the manufacturer specific advice before purchasing.